Would a Boker knife with a Ceramic/Titanium, or X15T.N steel blade interest you? For 135 years the Boker Knife Company has been building a world-wide reputation by providing affordable, high quality German knives made with careful craftsmanship and superior materials. In recent years they've been strengthening that reputation by pioneering the use of Ceramic, Titanium, Cera-Titan, and X15T.N Steel blades. Are You Looking For Traditional Materials? If you admire the rugged stag and glowing wood of classic German knives, you might find a knife with Boker natural handle materials irresistable. Do You Prefer Modern Materials? Are you looking for a German knife made with the finest possible modern technology? If you're looking for a knife handle that's almost indestructable, Boker synthetic handles are as tough as they come. Are you curious about a Boker Knife made with space-age, high-tech, modern blade materials? And you might be surprised by the edge holding qualities of a Boker ceramic knife. Did you happen to handle a Boker Hunting Knife at a shop or a show that made you start wondering if there's a model available that's perfect for you? Boker still makes beautiful fixed blade hunting knives with Stag, Rosewood, or Amboina handles. The blades are forged from 440-C, and are available with clip point or drop point blade shapes. 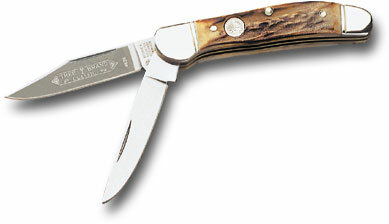 Classic Boker Folding Hunters are available in traditional models with stag handles and blades of 440 C steel. Ultra Modern Boker Folding Hunters are available with handle materials of ABS, Aluminum, Zytel, or Titanium, and blades of CPM-440V steel, X15T.N steel, 440-C steel, ceramic, titanium, or cera-titan. 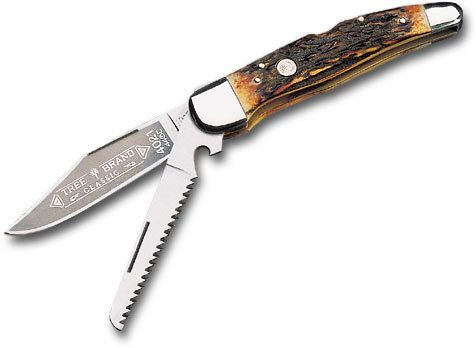 Have you been looking for a sharp, tough, non-corroding boat knife? 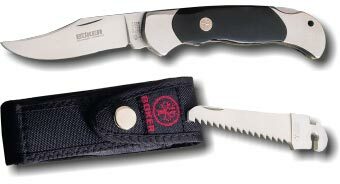 The Badger Model Boker Knife, #110090X pictured above, is a light, fast opening folding angler's knife. It's available with an ABS handle with Kraton inserts, and a blade of X15T.N steel. I've owned this Boker folding knife, and it's the best working knife I've ever had. It's easy and smooth to open and close, holds a shaving edge through hard use, and hasn't shown any corrosion. Its been wet dozens of times and I've used it with a variety of cleaning chemicals and solvents. I've used it to scrape gaskets off of valve plates and cylinder heads, and to cut a variety of industrial materials, and I can still hardly find a scratch on the blade. It's simply tougher than anything I've used it on. Have you been trying to find a little more practical information about Boker's premium quality German made kitchen knives? Boker kitchen knives are available with delrin or pom handles, and with ceramic, titanium, or cera-titan blades of various lengths. Handle shapes have been carefully designed to provide precise control of the knife, and blades are shaped to allow the entire cutting edge to be used safely and efficiently. Ceramic, titanium, and cera-titan blades hold an edge far longer than any steel, are corrosion proof, and, with simple rinsing, do not hold and transfer food flavors. If you're looking for an affordable, beautiful, and unique German made Boker knife to add to your collection, a Limited Edition Boker Damascus Knife might just take your breath away. They're available with special handle materials and matchless Boker damascus blades. In addition to Commemorative issues of standard models, several other series of Collector grade Boker Knives are also available. You must have a knife that is utterly dependable. You can pick a Boker Knife from a variety of folding and fixed styles that will handle back-woods duty with 100% reliability. 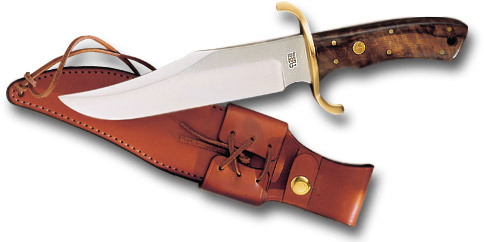 If you agree with the philosphy "The farther from the road you go, the bigger the knife you need", you might enjoy taking a look at Boker's German made Bowie Knife, the Model 547. Would you be interested in a lightning-fast folding knife? The Speedlock 3000 Boker automatic knife is available as a push-button opening knife that provides extra security with a secondary safety. It may offer the exact advantages you've been looking for. 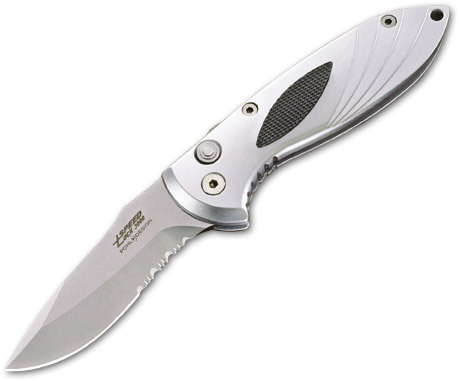 Another superior tactical grade folder that was introduced recently is the Boker Turbine. It's a tough, compact knife built for arduous duty, and it might be worth your time to take a look at it. If you're looking for a fixed blade field knife, the Boker A F knife, made of 440-C, is an outstanding German made military style Boker Knife built with modern materials, and it's available in single and double edge models. Another superb military grade Boker knife is the Boker Orca, a German tactical/diving knife with a blade of X15T.N stainless. It was developed in co-operation with Germany's GSG-9, and it looks like it's almost indestructable. Unfortunately, it is no longer available as a regular production item, but you might find it at Amazon.com. A recent addition to Boker's line of military grade knives is the Boker Trench Knife, a magnificent re-creation of the German Military Field Knife of the early 20th Century. Boker's model 2110 and 2100 are folding fighters designed by Prof. Bill Newman of Latosa Escrima, noted European Defensive Tactics instructors Frank B. Metzger and Joachim Friedrich, and Boker designer Dietmar Pohl. They are impressive, robust knives made with premium quality materials. There are, of course, other folding and fixed blade Boker Knife models that would make excellent self-defense or fighting knives. If you're looking for a utility knife you can carry everywhere, all the time, every day, you might find a Boker Pocket Knife absolutely perfect. Return from Boker Knife to the German Knife .com home page.